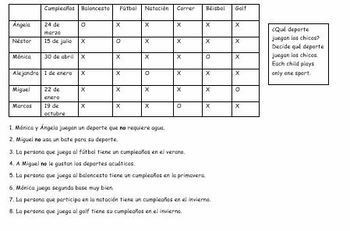 This is a one-page logic puzzle in Spanish that centers around sports. There are six kids who play six different sports. Who plays what sport? 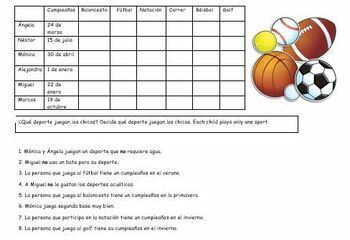 There are eight clues in Spanish that students will use to decide. A working knowledge of dates and seasons will help, but if your students don't know these words you can add a text box with useful vocabulary. Logic puzzles are good for students' brains and they will ask for more of them after doing one! The document is editable.